The lingering crisp aroma of home-made chips (cooked in the Actifry pan with just a tablespoon of sunflower oil) combined with the scent of the log fire as I walk from the kitchen into the lounge triggers the memory of my grandparents' house in Dafen, Llanelli. Although the scent of memory lies: those chips would have been cooked in lard, the fire made of coal, the heat localised around the grate in the kitchen rather than filling the ground and first floor of the house as our log burning stove does. They moved into that house around the mid 1960s although my first memory of it is from 1966, the date fixed by a family holiday at Butlins in Pwllheli, North Wales and how we called in to see them on the journey home from north to south. 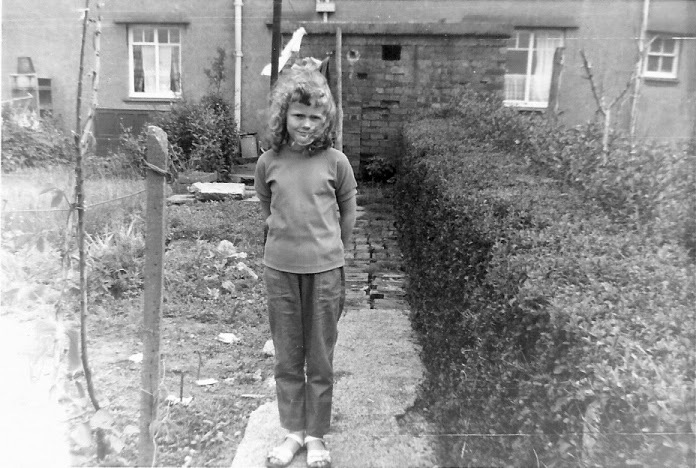 I remember the outfit I am wearing standing on their narrow, brick and concrete garden path for a photo, an outfit that repeats itself in the Butlins' snaps. Different shades of green in a photo that is only preserved in shades of grey. Food and drink, clothes. My memory triggers. I remember what I was wearing on my first (blind) date with Tony in February 1985: a black and purple, above-the-knee, knitted tunic dress with a wide shawl collar. I remember he wore a dark grey flecked suit and a bow tie. I remember the 'tent' dresses my mother made for me and my sister Shan in the 'psychedelic' years of the late 1960s: pink and yellow swirls with front zips. We wore them with love beads, (of course we did! ), those thin long strands of tiny beads strung together with silver-coloured wire. What are your triggers? Music? Books? Cities? The sound of a train? The smell of old leather handbags? What carries you back to the past? What awaits you there? Write a list of memory triggers.